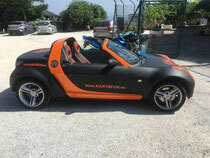 This tour is a very nice combination of sightseeing and karting in the mountains. We will drive to the interesting village Ronda in the mountains, with the famous old bridge Puente Nuevo between the two parts of the village, and it’s stronghold. The way itself is the target! We will start the tour from the meeting point and then drive along the A-397 road to Ronda, where the first break will be at the well-known biker hangout. After that, we drive directly to the center of Ronda. From here, you will have 2 hours on your own, (or longer after arrangement). It’s a very nice village to take pictures in and to enjoy all the great views. After that, we will drive the same way back, with a small break on the way. STOP and Read This! What A Great Day! If you love driving and you are a thrill seeker, please book this trip, it’s a fantastic way to enjoy the beauty of Spain, while driving insane karts. Absolutely everybody in our group loved the experience, the breathtaking views and the little coffee stops in Spanish places. Me and my friends took 2 different tours with Reiner and we absolutely loved both. We took a short tour that lasted a little bit over 3 hours up and down the Ronda Road(we were sad when it ended), then we did a different one in a different day, a 6 hour tour up the Ronda Road coming back on the Monda-Marbella Road. If you think you can handle a little bit more driving, you should book the 6 hour tour, the views are breathtaking and the roads are insanely twisty and exciting. We will definitely do this tour again with more friends. I recommend you bring warm clothes and don’t worry about gloves and helmets, Reiner will provide you with both them. 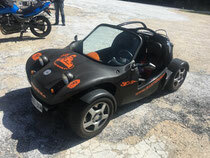 Where in the world can you drive a go kart on public roads? Marbella…! 🙂 An amazing experience for everyone who wants a unique way of seeing the beautiful road up to Ronda. I strongly recommend the longer tour, the scenery is just breathtaking. Rainer was professional in guiding the go kart tour. He provided quick and simple instructions to follow. The drive itself was fun and adventurous. The curvy roads up and down the mountain made the trip exciting. 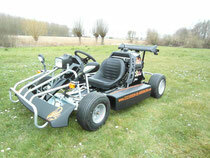 I would definitely recommend giving this go kart adventure a try. You will definitely enjoy it.